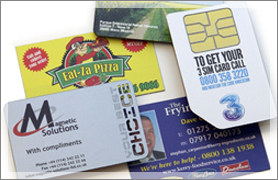 Our standard Promotional Magnets are produced using our 0.5mm material but as a specialised magnetic company, we have a wide range of options available ranging from 0.3mm to 2mm, allowing us to produce a variety of magnetic printed promotional products, for use in a range of applications from classroom to kitchen. 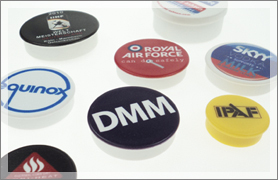 All our promotional magnets are made to order and can be produced to any bespoke size or shape, meaning you aren’t confined to the boundaries of existing templates, and as we don’t charge tooling costs for bespoke designs, your clients aren’t penalised for producing a design that fits their specific requirements. 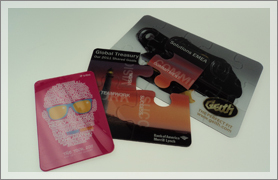 As well as bespoke shapes, our tooling also allows us to produce bespoke, kiss-cut word games and puzzles, all at no additional cost to our standard fridge magnets, and our extensive in-house print facilities enable us to offer a high volume, fast turnaround service across our product range. We are constantly evolving our range and in addition to our standard fridge magnets, which are available in thicknesses ranging from 0.3mm up to 2mm, we have also developed the excellent PlexiMag material. 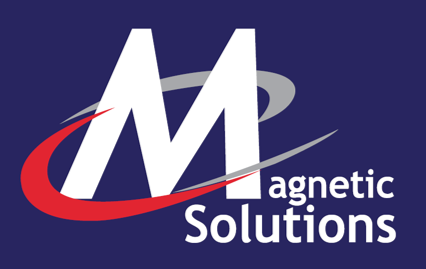 As a specialised magnetic company, we have a wide range of materials available so we can produce a variety of magnetic printed promotional products, for use in a range of applications from classroom to kitchen. 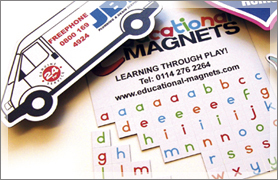 We also supply a wide range of additional promotional magnets such as printed memo or office magnets, magnetic rulers, magnetic word games and puzzles, magnetic calendars and magnetic photo frames. In additional to this, we are also able to offer our magnets with a write on wipe off, dry wipe finish. Please Note: We only supply trade customers and cannot supply to end-users.